Luke Falk, who was born in Logan, Utah, and returned there for his final two years of high school, broke Matt Barkley's Pac-12 career record for touchdown passes of 116 as the Cougars defeated Utah 33-25 in Salt Lake City. UPDATE: With the Apple Cup at Husky Stadium looming in two weeks, the Cougars came up with their most impressive road performance this season on Saturday, defeating Utah 33-25 in Salt Lake City as Luke Falk threw an 11-yard touchdown pass to Tavares Martin Jr., a 1-yard TD to Kyle Sweet — the 117th of his career, breaking the Pac-12 record set by USC's Matt Barkley from 2009 to 2012 — and a 6-yard TD to Isaiah Johnson-Mack, and Erik Powell kicked field goals of 44, 32, 28 and 33 yards. Falk threw 69 passes, completing 40 (10 to Martin) for 311 yards, boosting his career total to 14,124 yards, eighth all-time in NCAA Division I; his 118 TD passes ranks 10th. WSU's defense, led by DT Hercules Mata'afa (8 tackles, 5 for loss, 3 sacks) forced seven turnovers and picked off Utes QB Tyler Huntley three times. Utah scored on Matt Gay's 56-yard field goal, Zack Moss' 2- and 1-yard runs, and Huntley's 12-yard pass to Raelon Singleton. Cougars senior LB Isaac Dotson returned to his starting position, playing for the first time since leaving the Oct. 7 game at Oregon injured; another senior LB, Dylan Hanser, left the game in the second quarter with an undisclosed injury and did not return. Luke Falk sat out his junior year of football at Logan (Utah) High School after transferring back to his hometown from a school in Southern California, and as a result was lightly recruited as a senior, drawing interest only from Cornell, Idaho and Wyoming. Instead, he opted for Washington State — which offered him only a chance to walk on — intrigued by the possibility of playing in Mike Leach's high-powered Air Raid offense. He stepped in on the first day of November 2014 after Connor Halliday's season- (and career-) ending broken leg against USC and started the final three games, throwing a whopping 241 passes and completing 152 of them, for a dozen touchdowns; the job has been his ever since. Neither Falk nor the Cougars regret his decision: In last Saturday's stirring, come-from behind 24-21 victory over Stanford, then leading the Pac-12 North Division, he threw for 337 yards and three touchdowns, including the game-winner late in the fourth quarter in his final home game. He now holds the Pac-12 record for career passing yards (13,801) and with 115 touchdown passes, needs two to surpass USC's Matt Barkley for the conference record. 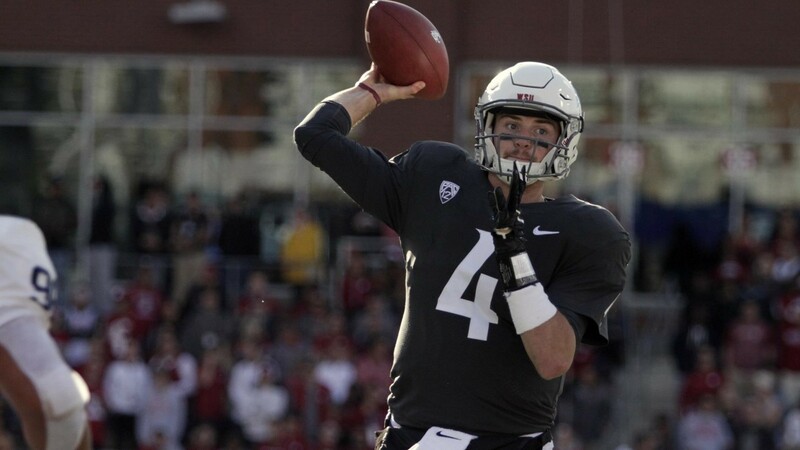 Through a Pac-12 scheduling quirk, Falk has never quarterbacked the Cougars in his home state; that changes Saturday afternoon (2:30 pm; Pac-12 Network, KXLY 920 AM), when No. 19 Washington State (now 9-2, 6-2 Pac-12), seeking its ninth victory and still in contention for the North Division title, travels to Salt Lake City to face Utah. The Cougars have been anything but road warriors lately, dropping their past two games away from Pullman by a combined score of 95-40. The Utes (5-5, 2-5), who spent the month of October either coming up just short (vs. (Stanford and USC) or looking completely overmatched (vs. Arizona State and Oregon), going oh-for the-month. got well in a hurry last Friday at home, demolishing UCLA 48-17, through the Bruins were without starting QB Josh Rosen, sidelined with a concussion. They're far from mediocre — the Utes gave the 13th-ranked Trojans all they could handle in L.A., scoring a touchdown in the final seconds and failing to force overtime when coach Kyle Whittingham decided to go for two points, rather than kicking a game-tying extra point — but there's no signature win against a quality opponent to their credit, the type that gets the attention of bowl-game committees. Beating Washington State would check that box; Utah also needs one more win to become bowl-eligible. The teams haven't played in more than three years, a 28-27 Cougars victory in September 2014, as Falk sat on the sidelines watching Halliday rally WSU from a 21-0 first-quarter hole. It was the highlight of a desultory 3-9 campaign, Mike Leach's last losing season in Pullman. Defensively, the key for Utah is getting pressure on Falk; if he can stand back in the pocket and find the open man, he'll pick the Utes apart. Utah hasn't been able to generate an effective pass rush (just 15 sacks in nine games) but the Cougars' O-line has been unable to keep QBs upright, surrendering 38 sacks. Falk has absorbed 33, including nine in a 37-3 loss at Cal last month as he tossed a career-high five interceptions. Not surprisingly for a Whittingham-coached team, Utah's defense has been solid against both run and pass, though not as good in both categories as WSU's undersized but quick unit that now leads the nation in tackles for loss with 94, an average of 8½ per game. Both teams boast D-line studs; WSU's Hercules Mata'afa will play on Sundays next year, and Utah's Lowell Lotulelei can join older brother Star, a former Utes standout, in the NFL this year or next. Offensively, the Utes present a challenge in sophomore Tyler Huntley, a dual-threat quarterback and reasonable facsimile of Arizona's Khalil Tate, who ran wild and passed effectively against the Cougs two weeks ago. Huntley, who has completed 67 percent of his passes and accounted for 15 TDs, began the season as the starter and led the Utes to a 4-0 start but departed in the fourth game at Arizona with a shoulder injury. Utah struggled in his absence, but he starred against the Bruins last week, throwing for four touchdowns and running 18 times for 93 yards. The Utes are 5-1 with Huntley under center, 0-3 without him. He has weapons: Zack Moss has rumbled for 772 yards (5.4 per carry) and five touchdowns, while Darren Carrington, dismissed by Oregon this summer for off-field transgessions, is one of the Pac's top wideouts, catching 58 passes for 830 yards and six TDs; his 92.2 yards per game leads the conference. Falk, who commands a Cougars passing attack averaging 381 yards per game, second in the nation, wants to capitalize on a Utes secondary missing standout free safety Marquise Blair, a junior who left the UCLA game with a lower-leg injury and is done for the season. WSU spreads the ball around — James Williams (56), Tavares Martin Jr. (55) and Isaiah Johnson-Mack (50) all have at least 50 receptions, combining for 15 touchdowns. Leading rusher and senior captain Jamal Morrow, averaging 6.5 yards per carry, has caught 44 passes out of the backfield for five more scores. If it comes down to a field goal, both teams can feel good about their chances. WSU senior Erik Powell, a semifinalist for the Lou Groza Award, given annually to the nation's top college kicker, has twice been named the Pac-12's Special Teams Player of the Week this season. He's connected of 15 field goals in 18 attempts (3 of 4 from beyond 50 yards), including the eventual game-winner against USC. Utah junior Matt Gay, a soccer player who walked on this year and is also a Groza semifinalist, leads the nation with 21 field goals in 24 attempts (4 of 5 from 50 yards or more), and leads the Pac in scoring at 10.1 points per game. Mitch Wishnowsky, the Pac's top punter, averages 45.7 yards per kick; the Australian, who won the Ray Guy Award as the nation's best punter in 2016, has put close to half of his kicks inside the opponent's 20. UPDATE: Sam McPherson ran for 118 yards, caught a touchdown pass from Eric Barriere and threw for another, and Barriere ran for the third score in Eastern's 21-14 win. Eastern Washington fans wondering what the Eagles' usually high-powered offense looks like without star quarterback Gage Gubrud running it will get a chance to see Saturday (11 am; KXLX 700 AM) when Eastern hits the road to take on North Dakota in Grand Forks. Gubrud and starting linebacker Kurt Calhoun — both are juniors — were suspended for this week's game by head coach Aaron Best following an incident involving police in Cheney hours after last Saturday's 28-20 loss to Weber State. Both were arrested and charged with obstruction after attempting to prevent officers from arresting another man. Stepping in for Gubrud, who has completed nearly 63 percent of his passes for 2,897 yards and 22 touchdowns —and run for 356 yards and four more TDs — for an Eagles offense that has scored more than 40 points four times, will be redshirt freshman Eric Barriere, a three-star recruit who starred as a double-threat QB at La Habra High School in Inglewood, California. In three seasons there, he racked up 9,304 total yards and an eye-popping 130 touchdowns. Barriere has played in three games this season, completing one of his passes for 13 yards in the season opener at Texas Tech and tossing the other for an interception. Sophomore Jack Sendelbach will start in Calhoun's stead. Entering the season, this game looked to be a marquee matchup; Eastern and North Dakota, who didn't face off in 2016, were Big Sky co-champions, both going 8-0 in conference play. Neither team has lived up to lofty, perhaps unrealistic, expectations: The Eagles (now 6-4, 5-2 Big Sky), whose 12-game conference win streak dating back to December 2015 was snapped last month at Southern Utah, have dropped two straight Big Sky games. They remain ranked, dropping 10 places to 21st in this week's Football Championship Series Top 25 coaches' poll. North Dakota (now 3-8, 2-6) has been the Big Sky's biggest underachiever, losing to four teams — Montana State, UC Davis, Montana and Sacramento State — that Eastern defeated. The Fighting Hawks, whose defense has surrendered 36 points per game, lost those games by an average score of 43-22; Eastern won 'em by an average of 43-33. One thing North Dakota does well is run the ball: Two Fighting Hawks have run for more than 600 yards: starter John Santiago (675 yards, 6.1 per carry, 5 TDs) and backup Brady Oliviera (604 yards, 5.9 per). Stopping the run has not been a strength of Eastern's defense; the Eagles have been gashed for more than 211 yards per game and given up 25 touchdowns on the ground.